If you’ve been reading this blog from the beginning, you may already know how we came to be debt free back in November 2014, but I thought it would be helpful to summarise what happened for new readers to the blog! When you’ve read this post, you might want to check out the rest of the Debt Success Stories on this blog to find out how some amazing personal finance bloggers became debt free. I’m sure you’ll find them as motivating and inspiring as I do. My husband and I were plagued by debt for a very long time. Ever since we both reached the legal age to obtain credit, that’s exactly what we did. You can read all about how we got into debt (twice) by checking out our Debt Story page, but in a nutshell, the debt was the result of many years of wanting what we couldn’t afford and not thinking about the consequences. Our debt turned sour a couple of times, eventually resulting in a debt management plan where we had to negotiate a lower monthly payment to our creditors. 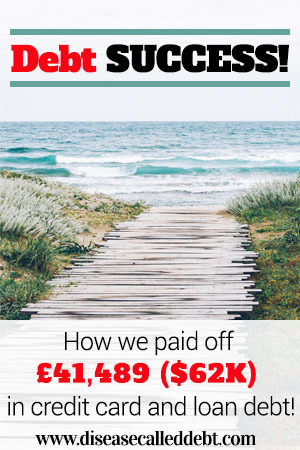 Our debt at its highest was a massive £41,489 (just over $62K) – and this didn’t include mortgage debt, it was the very worst evil kind of debt built up from credit cards and loans. What made us tackle our debt? When we were in debt, it was like there was a black cloud hanging over us ALL of the time. The debts impacted just about every decision we made from what we could afford for our weekly food shop to having to say no to social engagements. Holidays and luxuries became totally out of our reach because when things got really bad and more credit was no longer an option, there was no way we could afford them. The debt had a huge impact emotionally and my own confidence and self esteem was at an all time low. I worried non stop about everything and at one point I was diagnosed with depression which looking back stems from all the stress we were under from our debts. We felt like we couldn’t talk to anyone about what was going on because we were ashamed and embarrased about the situation we had created. That’s why I started Disease Called Debt, as an anonymous blogger, so that I could vent my frustrations here about the struggles we were facing. When I started this blog, it was a turning point as we then realised we couldn’t go on the way that we had done for so long. Before the turning point, we knew we had to try to pay the debts off and we did try – several times, before finally making the changes that were needed to succeed. One of the biggest challenges we faced was continually failing and giving up on trying to get out of debt! We gave up several times because it was hard to scrape together even small amounts of money to put towards the debt. It just seemed too difficult especially when life was carrying on as normal around us. The trick to overcoming that particular challenge was just to carry on making small steps even when they were so tiny they were hardly noticeable. Because eventually, those small steps made a tangible difference and we started to see results. Not being able to get any more credit definitely helped us as in the end there was no way for us to make things any worse. Lastly, the fact that we earned a low income as a family was a challenge as we had to find lots of creative ways to make money to put towards our debts. I believe the reason why we failed so many times before was because we didn’t have a good enough reason to want to succeed. We had to hit rock bottom to learn that we never wanted to go back there again. That in itself was pretty good motivation to keep going but mostly, this blog has provided the most unlikely source of motivation that we needed to become debt free. When I started blogging, I found that we weren’t alone in having tons of debt to pay off. There were plenty of other people in similar situations to us. We started getting involved in the wonderful personal finance community and found incredible support there from fellow bloggers who encouraged us to keep going even when we hit roadblocks along the way. I wrote a post a while back about the financial sacrifices we made to get out of debt which included all the cutbacks we made to speed up our debt repayment. In truth it was more than just cutbacks though. The changes we made impacted on how we spent our free time – we stopped watching TV and looked for ways to make extra money instead. I used to just chill out on the sofa once my little girl was in bed, with a couple of glasses of wine to try to forget our debt problems. As our debt journey progressed, I instead used that time to sell things on eBay, work on the blog and start taking on freelance writing jobs. Through making extra money and saving every penny, we cleared our debts using the debt snowball method, by clearing the smallest debt first and then using the money that was freed up to pay off the next smallest debt. We started with our overdraft as that was the smallest debt and finished with the last creditor in our debt management plan to whom we owed the most. Clearing those debts one by one was another big motivator! During this time, we managed to succesfully claim a large PPI refund and we used every penny that we received to pay off our debts. In addition, we negotiated a couple of full and final offers with some creditors to clear our debts for less than what was owed. The reason we did this was because we had been in our debt management plan for some time and those particular creditors were keen to settle the debts as much as we were. What does debt freedom look like? It’s pretty great. Scratch that – it’s fantastic. The best thing is not worrying so much – I still worry about how we’re going to buy a home and save for retirement – but the constant dread of phone calls from creditors and worrying about whether we can afford to put food on the table has gone. We feel happier, more relaxed, less guilty for the mistakes we made before and we can sleep better at night. Are you trying to pay off debt? If you’re trying to pay off debt but you feel like you’re taking one step forward and two steps back, my advice to you is simply to keep going. Paying off debt is a little bit like trying to lose weight. You put an immense amount of effort in for a few weeks and then it becomes incredibly difficult and you find yourself wanting to go back to your old ways. Yet, long lasting weight loss is down to making real change in terms of diet, exercise and lifestyle. It’s the same with paying off debt. Every tiny bit of debt you pay off will help you in the long run as long as you don’t reverse the progress you make by adding more debt and giving in to spending on credit. Get started by just not using credit anymore and try to make overpayments frequently, even weekly – it doesn’t matter how much in the beginning. The main goal is to change your habits. I hope our debt success story has helped or inspired you in some way if you’re trying to get out of debt. Getting out of debt isn’t easy but it definitely is possible to do just that and start living the life that you want. Don’t be afraid to ask for help if you need it! In the UK, debt charities such as Step Change and National Debtline can give you free and impartial debt advice. Like this post? I’d be really grateful if you would pin it on Pinterest and follow me! This is truly inspitaional. It does show what we are all capable of achieving if we do not give up. The Dave Ramsey’s Financial Peace throws more light on the debt snowball method of debt elimination. I really found it helpful. Thank you for sharing this. Hello Esther, thank you so much for stopping by and commenting. 🙂 I am a fan of Dave Ramsey and the debt snowball approach made logical sense to me right from the start. I could see how motivated I was going to be by eliminating the debts one by one. It did work for us! Very inspiring story of someone who paid off debt. I agree with you that lifestyle changes during this process like what you did you watch TV less. But before that, I think acceptance is really a factor, which can determine whether you’ll be successful or not. Acceptance is definitely needed in order to get going with getting debt paid off! Thanks Jayson. I hope your story inspires others to keep going on their debt payoff journey. Congrats again! Great story Hayley! Ever since you had the post about making overpayments weekly, I’ve been making overpayments on my debt as often as possible, sometimes even more than weekly. This really helps me to not get in the trap of seeing that I’ll have extra at the end of the month and end up spending it instead of putting it toward debt. Now I put it to debt the instant I have access to the extra money. Thank you Kayla! I’m so glad that you found that post helpful and that’s it made a difference to how you tackle your debt! Great post!! I love your story, mainly because there are a lot of similarities with mine – totally amount of debt, having a bottom moment that finally forced the motivation to make a change, and starting a blog to tap into the awesome PF community. Now I just need to get to debt-free, too! Amy @ DebtGal recently posted…I Am So Excited About This!! The biggest thing is to not get discouraged. Well… more accurately, it’s to not let the discouragement stop you. We have health problems that affected our ability to earn (I couldn’t work one job, let alone get a second one) and meant that we had medical bills. We got discouraged a lot. Other bloggers were able to put $1,000 or more against debt each month. I’d be excited when we could do $500. But we had no choice other than to keep going. So we did. And eventually we were out of debt. It took us about 6 years, a move to a cheaper state and my finally getting a job toward the end. The point is, it finally happened. Eventually. And it was still as sweet as anyone else finishing with debt. Abigail @ipickuppennies recently posted…What could go wrong? Hi Abigail, thank you so much for sharing a snippet of your story with us. I’m so glad that you managed to become debt free despite the odds. Looking forward to posting your full debt success story here on the blog soon! I love this that you faced it head on..eventually. Worked hard and made it! I know that feels like a weight lifted off your shoulders. Congratulations! One thing that really helped us pay off our debt and our mortgage was having weekly budget meetings (sometimes twice a week!) to stay motivated and stay on the same page as a couple. You rock, Hayley! And I think getting that the small steps add up is crucial to paying for anything; debt, a home, retirement… We can look at our paychecks and decide that since we can’t do huge things we shouldn’t do anything, but if we instead choose to do the small things we can we’ll be amazed at the progress we can make, as evidenced by your beautiful story! I love the story of your journey – especially how you went from vegging on the couch to hustling. I mean, even if the first step results in you just staying in and vegging on the couch in the evening, it’s a start… but you’ll probably get bitten by the debt payoff bug and start re-purposing all sorts of previously spare time into hustling. I know I did.